When you picture a meeting, what springs to mind? Sitting around a boardroom table in a stuffy room with off-white walls, windows that you’re lucky enough if you manage to crack open a smidge? Or perhaps you’re all sitting on chairs in a circle. The dreaded circle. How about ditching the usual work-place style meeting room in some grey concrete building, or one of those motorway hotels, in favour of something slightly more unusual! From modern museums to historic houses, you’ll find rooms available to hire in the most unlikely of venues. 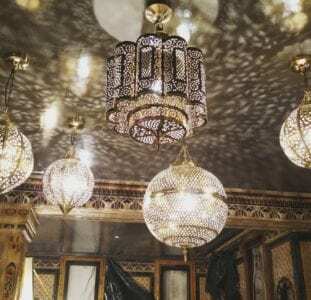 Here are some of the more unique places where you can hire rooms to hold your meeting in bustling central London. With three central London locations, you have an abundance of quirky meeting rooms available in these venues. How about ditching the table and chairs in exchange for a couple of sofas to get comfy on. Of course, the table option is still available for the not-quite-so-familiar-with-each-other amongst you! Rooms burst with natural sunlight, and the modern decor and colourful chairs will get you buzzing. Max. room capacities range from 15 to 120 depending on the location. Can I interest you in a private roof terrace with your meeting room, sir? Probably not what you’d expect to hear at your bog-standard meeting venue. But this ain’t no bog-standard meeting venue. State of the art facilities are also included. There’s a stunning variety of rooms available here, from the Felt Room (max. capacitiy 12) to the TV Studio (max. capacity 200). You’ll also find a games room and 36 seater cinema, should your meeting become a little dull! If you really want to impress your associates, hire a room at the one and only British Museum. The building speaks for itself, with its sense of grandeur and history. Combine historic art and artifacts with modern rooms and the latest AV equipment, and you’ve got yourself a unique meeting experience. Max. capacities range from 35 in one of the meeting rooms to 323 in the BP Lecture Theatre. Also included with hire is access to the museum’s collections and exhibitions. Looking for somewhere lavish and ornate to host your meeting? Then look no further than this now Grade II listed building, which was originally founded in 1817. It has recently been refurbished (not for the first time since 1817, I must add!) and sparkles wth mosaics, marble-floored rooms, gilt-edged décor, stained glass detail and oriental rugs. Though of course, all modern-day equipment is provided and a fabulous lunch can be arranged. Bounce has a number of locations, not only in the capital, but across the pond, too. The latest addition opened recently in trendy Shoreditch. The funky private rooms and spacious main hall with its state of the art presentation system, are ideal for meetings and conferences. Saying that though, you may not get a lot of work done at this venue what with the ping pong tables and UV-lit graffiti style artwork to distract you! 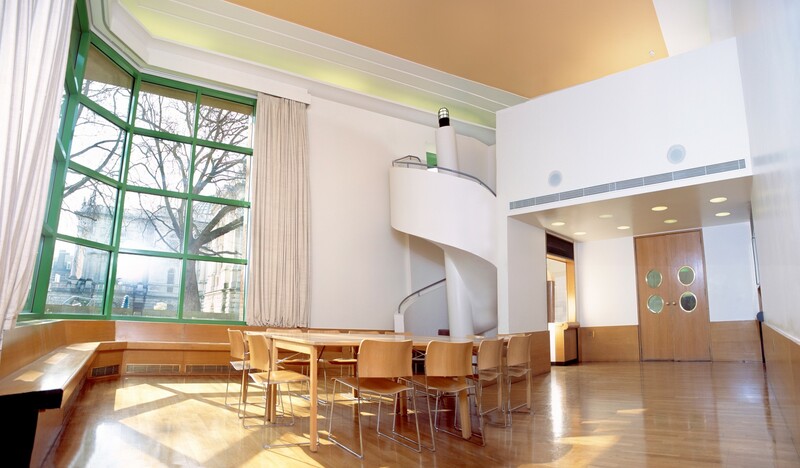 For a unique experience, hold your meeting in the prestigious Tate Britain with its diverse range of spaces. 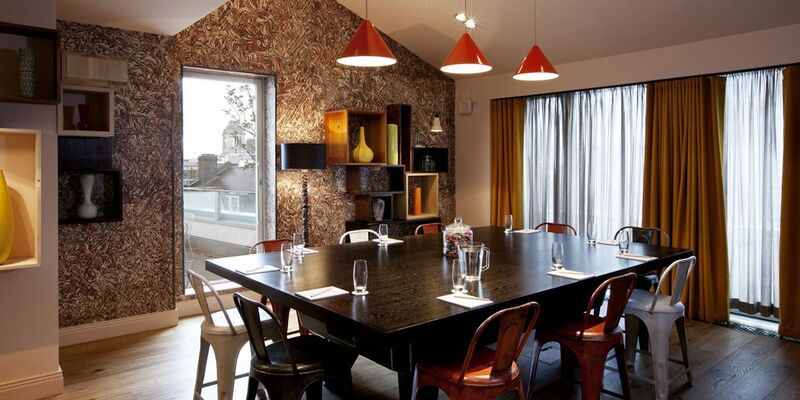 The Duffield Room is a bright and contemporary space that can seat up to 40 people. Or give a presentation in the fully equipt Clore Auditorium. How about taking a post-meeting tour of the collections? Or wander around the gallery beforehand for some creative inspiration. Don’t forget the café for your lunchtime break, or head to the restaurant if you’re feeling really hungry. 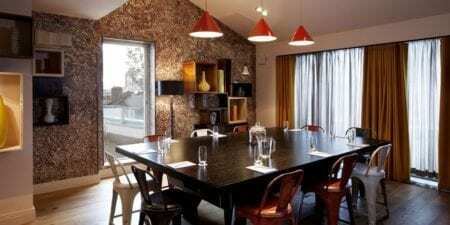 Fancy somewhere chilled for your meeting? Yes, you can indeed hire out London’s ICEBAR. The bar itself is made of the purest Swedish ice and kept at a cool -5 all year round. You may prefer something a little warmer to hold your meeting in though. The flexible Moose Room (as in, the layout is flexible, not that it contains a flexible moose!) can hold up to 24 people U-shape style and up to 60 theatre style. It can be combined with the Reindeer Lounge. Each room has state of the art facilities and all have air conditioning, which seems pretty ironic to me! 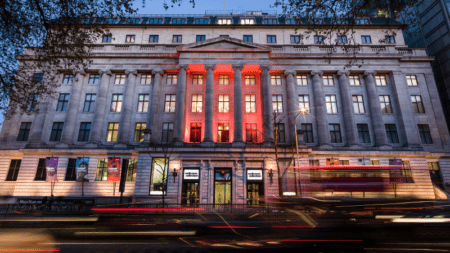 The Wellcome Collection, merging art with science, is one of London’s true gems. Full of fascinating artifacts in the Medicine Man gallery and thought-provoking exhibits in the Medicine Now gallery, holding a meeting here can hardly not inspire you. There are a number of versatile meeting rooms available, each fitted out with the latest facilities. Max. capacities range from 40 to 120 in meeting rooms, to 194 in the Henry Wellcome Auditorium. You don’t get more quirky than a Firmdale Hotel, and Ham Yard certainly doesn’t disappoint. Hold your meeting in the epitome of unique. 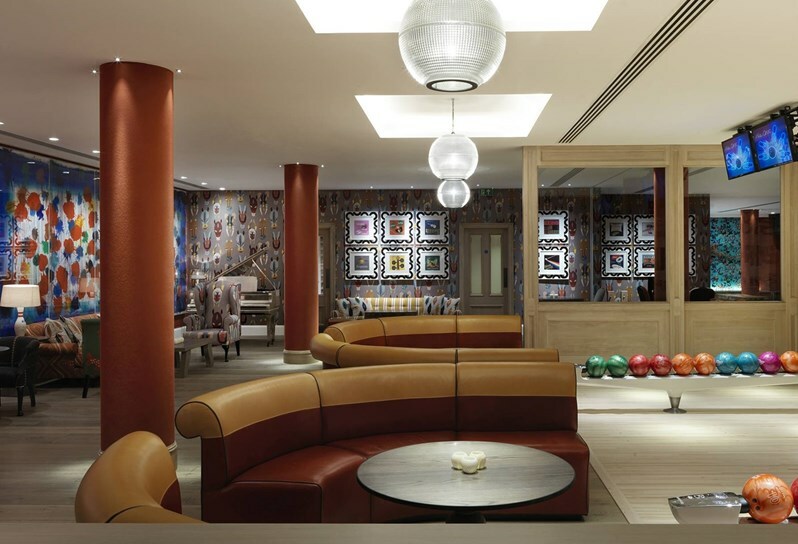 This hotel even has its own bowling alley, but we suggest that you perhaps wait until after your meeting to play. Why be restricted to always having meetings indoors? In the summer months, you might like to consider taking your meeting upstairs to the gorgeous Roof Terrace for a somewhat more relaxing set-up. 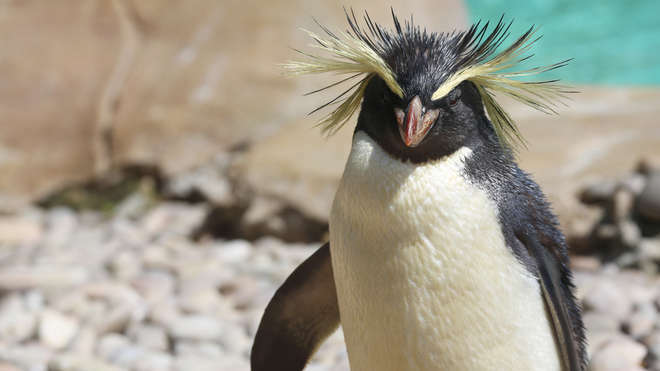 And last but not least – London Zoo. Why have I included it here? Because what kind of a meeting rooms list doesn’t contain at least one zoo?! Find yourself in one of the wondefully stimulating venues available to hire on site. 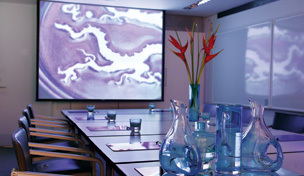 The stylish meeting rooms overlook 36 acres of zoological gardens housing a huge variety of different animals. And the best part about hiring a room here is that all the profits go directly into helping the conservation of wild animals and their habitats around the world.